Devie is a fintech marketing strategy and research professional with years of experience working with industry giants and startups. 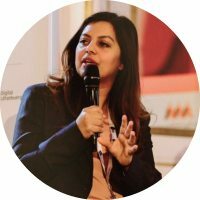 She has worked in strategy, marketing and analysis roles in firms like Goldman Sachs, Thomson Reuters, Ericsson, IBM, USAID and SunTec. She is a consultant and researcher for several fintech startups, banking innovation groups and investors with a keen understanding of the trends and activities of startups, banks and investors in the space. Devie has a good understanding of the international financial and technological markets, having grown up in India and lived in global financial centres like London, Stockholm, Washington DC, New York and Mumbai. Having traveled to over 42 countries and worked with teams in over 47 countries, she understands and analyses regional technology trends and market developments. With a computer engineering background, she is also passionate about inspiring young women to find success in technical fields. Devie holds executive degrees from IMD Lausanne, University of California Berkeley and Boston University School of Management. I worked in both the financial and technology industries when I started out – I hold a computer engineering and business graduate degrees and have always been combining these two in my life and career. My first job was as a summer analyst at Goldman Sachs in London, and later I worked in firms like IBM, Ericsson, Thomson Reuters, SunTec, etc. I have been independent for about 3 years now and have spent most of that time as a fintech evangelist. Financial inclusion and cashless societies are topics that are very close to my heart. A lot of the challenges in developing countries can be solved by having a technology-driven transparent, fair, community-based currency system. OUTSIDE OF FINTECH WHO ELSE INFLUENCES YOU ? Open banking will change the way banks and fintechs collaborate with each other. Regulations like PSD2 and the availability of more Open APIs will change the way tech and banking will work with each other. Also fintechs will start being regulated more and banks will get more concerned about security.